A civilian ARMORED CAR is a security vehicle which made by replacing the windows of a standard vehicle (typically a limousine or SUV) with bulletproof glass and inserting layers of armor plate into the body panels. Unlike a military armored car, which has armor plate mounted on the outside of the vehicle, a civilian armored car typically looks no different from a standard vehicle. 23 bulletproof cars from around the world - Cnet. AL CAPONE'S ARMORED 1928 CADILLAC - "Al Capone Cadillac sells for $341,000 at RM St. John’s." AL CAPONE'S ARMORED 1930 CADILLAC - Bonhams. BMW Showed Off Its New Armored SUV By Attacking It With A Machine Gun - Business Insider. Bulletproof Luxury Cars: How The Rich And Famous Escape In Style - Forbes. Bullet-proof Mercedes-Maybach S600 Guard revealed - "Not even rocket-propelled grenades can penetrate the S600 Guard's exterior thanks to ballistic-proof armour." MAYBACH GUARD - is an upgraded version of the Maybach that offers enhanced B4-level security for the occupants of the vehicle. Mercedes attacked a $513,000 Maybach limo with an assault rifle - Business Insider. Protection levels B1-B7 vs VPAM - Aurum Security. This is the $1.6 million armored Mercedes-Maybach limo you can’t have - Business Insider. 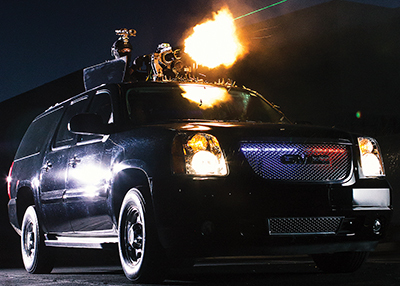 Top 10 Personal Security Vehicles - Criminal Justice Degree Hub. Which are some best armored vehicle companies? - Quora. Alpine Armoring - since 1997. "No one protects you better." A broad range of armoured cars, (automobiles, sedans, and VIP limousines) including major American, European and Japanese brand names such as Ford, Chevrolet, Cadillac, GMC, Chrysler, BMW, Audi, Nissan, Toyota, Lexus, Mercedes-Benz and more for US Government and other governmental agencies worldwide. ARMORTECH - since 2000. Russian international manufacturer and provider of armoured and specialty vehicles. Aurum Security GmbH - since 2012. "The Most Protected Civilian Vehicles in the World." Engaged into R&D, design, prototyping and manufacturing of protection systems and armored military and civilian vehicles. BMW SECURITY VEHICLES - "We don't aspire to meet the highest standards. We exceed them." BMW has been setting new standards in the design and development of armoured vehicles for over 35 years. Our current model range continues this tradition in impressive style. CENTIGON - since 1876. "Protection. Innovation. Worldwide." 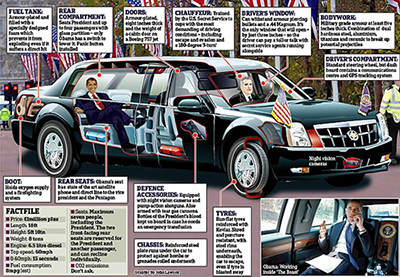 With almost 10 decades of industry leading experience, 45 current Heads-of-State limousines in operation. Security vehicles, armored cars, special limousines. World's largest armored vehicle manufacturer and global security systems provider. CJL Armoured Protection vehicles - since 2001. "Armoured & Luxury Chauffeur Driven Cars." Discreet Professional Protection. IAG | INTERNATIONAL ARMORED GROUP - since 2004.Manufacturer of high quality armored vehicles, with facilities located in the US, UAE, Turkey and Bulgaria. "Quality conscious armored vehicle manufacturer with over 20 years of experience specializing in the fields of design, engineering, prototyping and manufacturing of armored commercial and tactical vehicles, such as armored cars, SUVs, trucks, buses, ambulances, CITs, APCs and MRAPs"
INKAS - since 2000. "Armored Vehicle Manufacturing." Leading Canadian-based company that specializes in the design and production of a wide range of armored vehicles, including executive SUVs, luxury sedans, special purpose vehicles, personnel carriers, cash-in-transit vehicles, and others. JANTI SECURITY SERVICES - since 2008. "Quality Service beyond Excellence." Sales, distribution, building of fleets, and maintenance of new armored vehicles, bullet proof cars, buses, and SUVs which are approved by "NIJ" National Institute of Justice, which has approved Armoring levels B4 to B7. Mercedes-Benz S600 Pullman Guard - (2010-). "The new large state limousine from Mercedes-Benz." Official site. MERCEDES-MAYBACH S600 2019 - "This vehicle sets a new paradigm for armored engineering excellence: due to modern composite materials used throughout the build and lightweight armoring techniques, the overall effect on this stellar vehicle’s performance is minor and rarely noticed by most drivers." Range Rover Sentinel - since 2015. "Range Rover Sentinel combines class-leading levels of occupant protection with luxury, refinement and off-road capability." This mobile fortress is designed to withstand the most damaging and targeted of threats including penetration by 7.62mm high velocity, armour piercing incendiary bullets. This exceptional vehicle delivers lateral protection against up to 15kg Trinitrotoluene (TNT) blasts and defence against DM51 grenade explosions from both beneath the floor and above the roof. RIDA - "Armoring and cars stretching since 1993." STOOF INTERNATIONAL - since 1865. "Germany's brand leader for armoured vehicles. Your security is our top priority." International manufacturer of armoured and specialty vehicles. Offers after-sales support and security driver training. The Armored Group | TAG - "Manufacturing Armored Vehicles Since 1992." Armored Vehicles, Bulletproof Cars & Trucks. Our world-class engineering and design team has the capability and experience to plan and build everything from an armored pick-up truck to off-road 4×4 armored personnel carrier (APC) vehicle and anything in between. 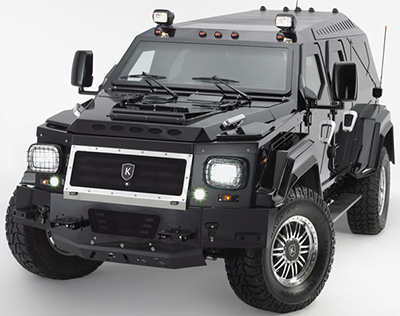 We specialize in these three categories of bullet-resistant vehicles: armored personnel carriers, personal protection vehicles, and cash-in-transit vehicles.